Glenn started his military path from day one, being born on Wright-Patterson Air Force Base in Dayton, Ohio. 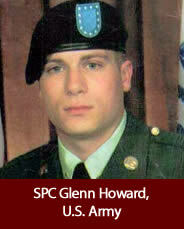 Coming from a military family Glenn grew up with a strong belief in serving our great country and his fellow man. His magnetic personality allowed him to inspire others to pursue their dreams and overcome their fears. Glenn worked as a health inspector in the U.S. Army, he quickly became someone the other soldiers trusted and could lean on because of his sense of humor and leadership skills. He was always there to listen with words of encouragement and wisdom. During his deployment to Iraq, Glenn always volunteered for extra duties outside of the kitchen. He sustained injures during a mission and was medevac’d out. His brothers in arms and the WWP profoundly impacted his life and he was very proud of the life the US Army enabled him to have. If Glenn were here today he would not allow the focus to be on him or his injuries as he always focused on others and would say someone else always had it worse. His family and those who knew him will forever be impacted by the Loss of a dedicated Father, Son, Brother, friend and so much more. He was a man of God and Country and will never be forgotten.